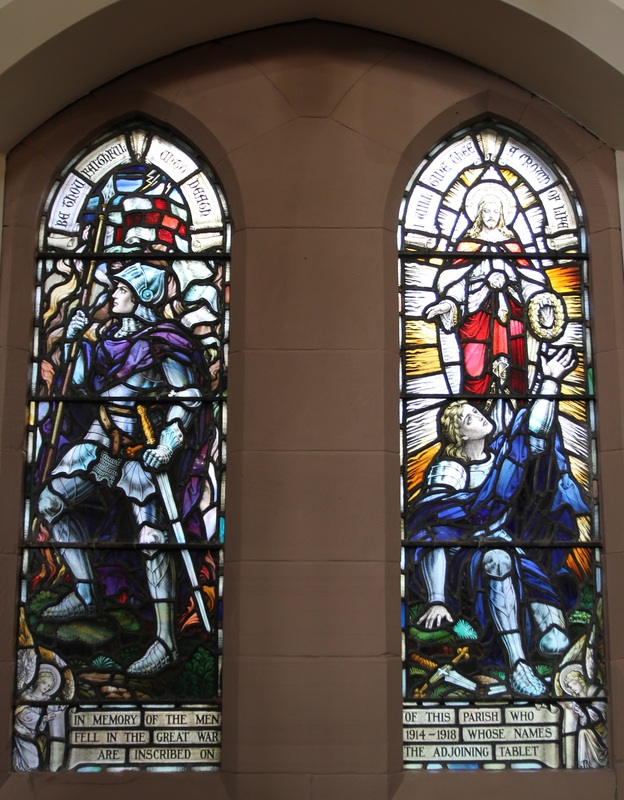 Troon Old has two War Memorials, commemorating the men of the Parish who fell in World War 1 and the men of the Congregation who fell in World War 2. The subtle distinction in the scope of these two memorials is due to ecclesiastical history. Until 1929, Troon Old was the established Parish Church for the whole town. After 1929, when the Church of Scotland united with the United Free Church of Scotland, Troon was split into the three parishes we recognise today: St Meddan’s, Portland and Troon Old. The memorials in Troon Old are listed in The Scottish War Memorials Project database. The World War 1 memorial comprises a pair of stained glass windows and an etched brass panel. The inscriptions at the top of the windows read “BE THOU FAITHFUL UNTO DEATH” and “I WILL GIVE THEE A CROWN OF LIFE”. 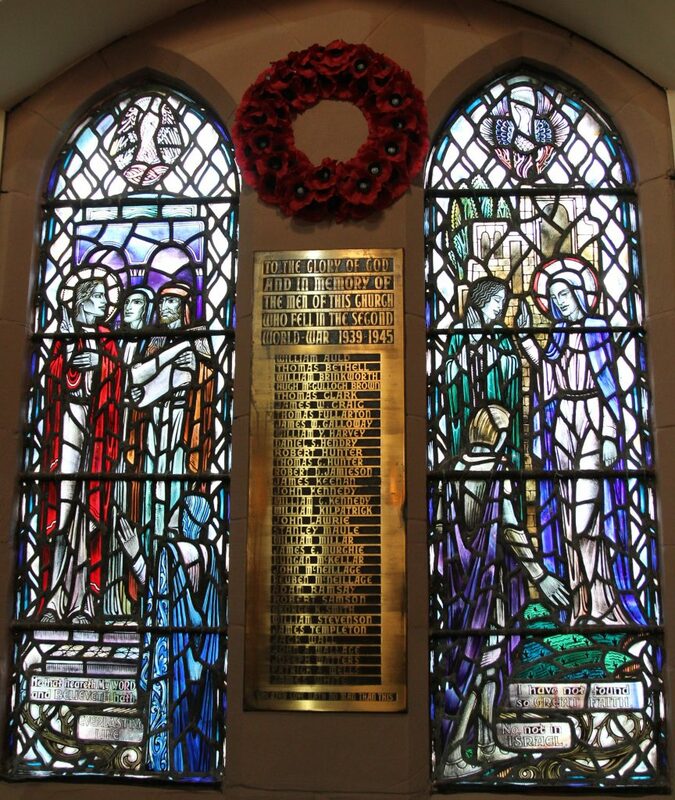 The inscription across the bottom of both windows reads “IN MEMORY OF THE MEN OF THIS PARISH WHO FELL IN THE GREAT WAR 1914 – 1918 WHOSE NAMES ARE INSCRIBED ON THE ADJOINING TABLET”. The World War 2 memorial is an etched brass panel. 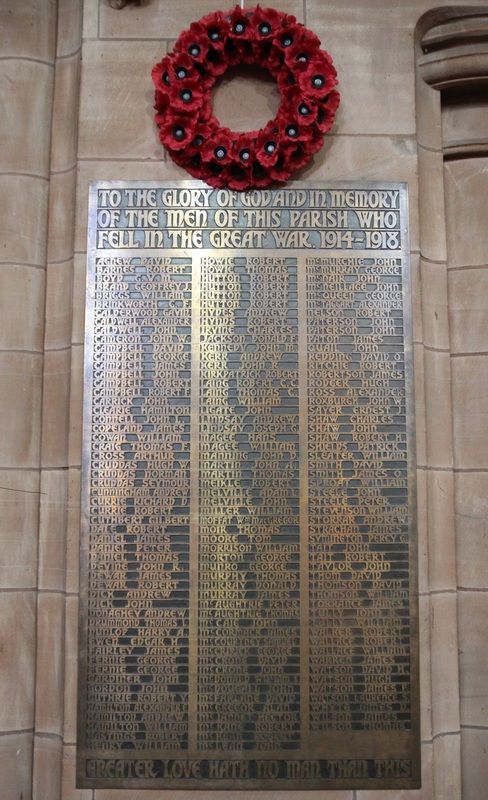 Of the 34 names inscribed here, 22 also appear on Troon’s civic War Memorial. The other 12 are names of members of the Troon Old congregation, but who are listed on other civic war memorials, including two at Loans and one at Ayr. Six of the 12 were in No. 4 Commando (based in Troon from 1940-1942), five of whom had married local girls.